NEW MEMBER CO-OP: Welcome, Good Tern Co-op! UPCOMING EVENTS: Co-ops at the NOFA Summer Conference & More! At a special event during the United Nation’s Political Forum on Sustainable Development on July 11 in New York City, the International Co-operative Alliance (ICA) acknowledged the UN’s recognition of the power of co-operatives to achieve the global sustainability. Now, the ICA is inviting co-ops around the world to learn more about the UN 2030 Agenda for Sustainable Development, consider their role in achieving the Sustainable Development Goals (SDGs), and pledge their support. “By actively engaging co-operatives around the world to make a specific measurable pledge toward the United Nations’ Sustainable Development Goals, the Alliance demonstrates that co-ops actually put their business where their values are – we walk the talk,” said ICA President, Monique F. Leroux. Adopted by the UN in September 2015, the 2030 Agenda for Sustainable Development aims to carry forward the work begun in 2000 by the Millennium Development Goals. This ambitious agenda sets a course to end poverty, protect the planet, and ensure prosperity for all by 2030. In partnership with the UN Economic and Social Council (ECOSOC), the ICA has been working to create and coordinate sustainable co-operative development by promoting and raising awareness on co-operatives, holding policy dialogues, and advocating policies that enable co-operative success. The Alliance showcased achievements of co-ops in creating decent employment, engaging public-private partnerships for food security and hunger eradication, and empowering women as community leaders – each key Sustainable Development Goals. At the event, the ICA presented the first results of its “Co-ops for 2030” platform. This global campaign unites and engages co-operatives in the SDG implementation process, and invites them to pledge their commitment to specific, measurable goals. Nearly 100 pledges have already been received. And at the International Summit of Co-operatives this fall, leading co-operators, global agencies, and world-renowned experts will gather for a full day of dialogue on resolving global issues and supporting the SDGs. The Neighboring Food Co-op Association (NFCA) is pleased to welcome Good Tern Co-op in Rockland, ME, as its newest member, joining over 35 food co-ops and start-ups across New England that are working together to support shared success and grow the Co-operative Economy. The Good Tern Co-op has served Rockland and the surrounding community since 1980, and is locally owned by 1,600 members. Good Tern maintains a vibrant working-member program, with over 300 members contributing their time to the success of the co-op and its mission of supporting the local food system and building community ownership. Annual sales in 2015 were $2.3 million, with revenues well above expectations for 2016. “We couldn’t be more thrilled to share our over 35 years of experience in the natural grocer industry with the next generation of food co-ops, and learn from our colleagues as we continue to build a successful and sustainable business here in Rockland,” added Jamie. The NFCA is a federation of food co-ops and start-ups across New England that are working together toward a vision a thriving co-operative economy, rooted in a healthy, just and sustainable food system and a vibrant community of co-operative enterprise. For a map of your Neighboring Food Co-ops, please visit http://nfca.coop/members. Have you noticed the “Cave to Co-op” signs in the cheese section of your local food co-op? The project is a partnership between Provisions International and the Neighboring Food Co-op Association (NFCA) to support artisanal cheeseproducers in our region and make their products more easily available to co-op shoppers. Each month, a delicious local cheese is featured at a great price. 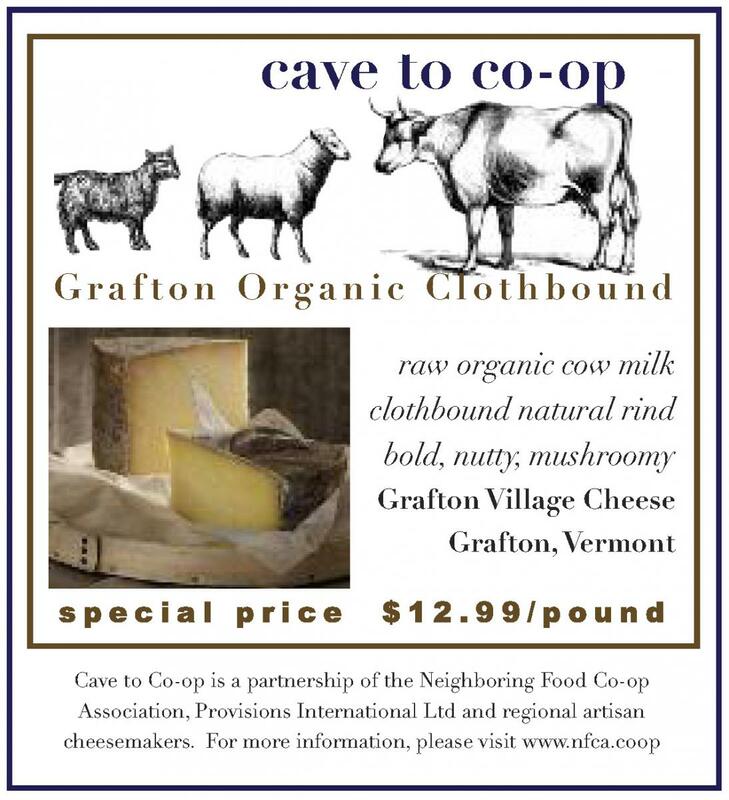 July’s “Cave to Co-op” special artisan cheese is “Grafton Organic Clothbound” Cheddar, a classic milled curd cow milk cheddar wrapped in cheesecloth while it ages slowly in Grafton’s caves for a minimum of six months. Grafton Organic Clothbound delivers a very bold cheese with both nut and mushroom notes. It is delicious any time of year on a cheese plate or in a sandwich or just eaten out of hand. As a food co-op member, you probably place a high value on locally sourced products. You want fresh, local produce for yourself and your family, and you want more of your food dollars to contribute to a more healthy, just and sustainable regional food system. By one USDA estimate, the local and regional food system accounts for more than $6 billion in retail food sales. The overwhelming majority of farmers engaged in this direct to retail sector are estimated to have operations with gross sales less than $75,000 annually. That means there are a lot of small farms that are working hard to provide wholesome, fresh and healthy foods to their neighbors while preserving New England’s rural character, wildlife habitat, and water quality. These farmers also contribute to their communities by supporting local businesses, jobs and infrastructure. At the same time, family farmers face some unique challenges in the Northeast, including high land prices, shortage of employees, and increasing regulations that add a disproportionate cost to running a small farm. When laws governing environmental, labor and food safety issues are promulgated at the national level, they are often in response to the interests of the largest of farms, most of which are outside of New England. These large operations and their associations, commodity boards and well-paid lobbyists, work diligently to protect the interests of their members and clients. Meanwhile, small and mid-sized operations, which represent the majority of family farms in our region, get short-changed by a “one size fits all” philosophy. NEFU exists to support the continued economic sustainability of our region’s family farms and fishermen. For example, over the past few years we have led the effort to ensure that the new Food Safety Modernization Act (FSMA) has the adequate flexibility necessary to protect consumers while allowing local and regional agriculture to continue to thrive. We successfully advocated for an affordable crop insurance program that addresses the needs of small, diversified farms. The Neighboring Food Co-op Association (NFCA) is an affiliate member of NEFU, representing the commitment of our region’s food co-ops to partnership with our family farmers and fishermen. Together, we have worked to increase access to healthy, affordable food and co-operative membership for more people, advocated for transparent labeling of Genetically Engineered (GE) foods, and supported co-op development – part of the National Farmers Union’s co-operative legacy that began over 100 years ago. Even though we are still months away from Election Day, the debate over the next Farm Bill is already taking shape. NEFU is a recognized progressive voice in this dialog – and in order to ensure that New England’s farmers and fishermen are heard in Washington, DC, we also need the voices of our region’s consumers. Cultivating The Organic Grassroots Movement. Neighboring Food Co-op Association (NFCA) is sponsoring a special track on “Co-operatives in the Food System” at the annual Northeast Organic Farming Association (NOFA) Summer Conference, August 12-14, 2016 at the University of Massachusetts in Amherst, MA. The workshops, which will take place on Friday, August 12 and Saturday, August 13, 2016 in Campus Center 803, address a variety of ways in which co-operative enterprises are improving the food system, practical steps for farmers interested in marketing to food co-ops, and strategies for applying this unique economic model to help make local food systems work for people with limited food budgets and to grow more economically and environmentally sustainable food systems. Do you love local food and farms? Want to get to know your farmer better -and to get a behind-the-scenes look into Vermont’s vibrant working agricultural landscape? Mark your calendar for Vermont Open Farm Week: August 15-21, 2016 taking place at farms across Vermont. Neighboring Food Co-op Association member food co-ops in VT are serving as material distribution hubs for local farmers in support of this event.